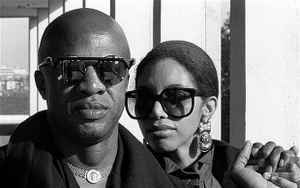 A singing and songwriting partnership of American musicians Linda Womack and her husband Cecil Womack. One of the most underrated bands of the late '80s early '90s. Still kind of creeps me out that after Cecil Womack and Mary Wells divorced in 1977 he married Sam Cooke's daughter Linda Womack, whom he had known since he was 13 and she was 8. At the time they married she was his "step-niece". Cecil's brother Bobby, who was close friends with Sam Cooke, married Sam's widow and Linda's mother, Barbara just 3 months after Sam's death. Bobby Womack admits in his autobiography "Midnight Mover," that Sam Cooke's family had a real problem with him marrying Sam's widow (Barbara). Especially, Sam's brother, Charlie. He told Womack, shortly after the marriage, "Man, anybody else could have married Sam's wife, but you. Sam loved you, man." If you ever come to Chicago...The threat was left hanging in the air but I knew what it meant. I figured if Charlie was going to do something, I wanted to get it over and done with. Barbara and I flew to Chicago. We checked into the 'Roberts Motel,' and I called Charlie. I told him, 'I'm here. We're in 2112.' In the motel room, Barbara busied herself loading bullets into a pistol. Barbara had a mean streak in her. Charlie showed up with his two brothers David and L.C. I opened the door and Charlie punched me. He beat me so bad, my whole head swelled up like a melon. My teeth came through my lip. He beat me unconscious. He even broke my jaw. Barbara came out of the bathroom screaming. She made a grab for the gun, she pointed it and pulled the trigger. It just clicked (I had removed the bullets while she was in the bathroom, before our guests arrived). Charlie and his brothers left. The cops were called, when they arrived and saw my condition, they said Charlie would do time. They arrested him later that evening but I declined to press charges. He was released and Barbara and I went on with our lives. It was reported that Bobby was having "sexual relations" with his then teenage stepdaughter Linda. Barbara found out, pulled a gun, shot at , then proceeded to chase Bobby out of the house, a bullet grazing his head. They were divorced in 1970. After Linda married Cecil, she never spoke to her mother again. To add to the Womack creep, Both Cecil and his other brother Curtis married and had children with Mary Wells.